Kuno Prey was born in San Candido/Innichen (Dolomites, Italy) on February 1st, 1958.After completing his education in Art and Design, he began operating in his own studio. He has a natural curiosity which is reflected in his interest in the use of new materials and technologies.K. Prey is a design consultant for numerous international companies. 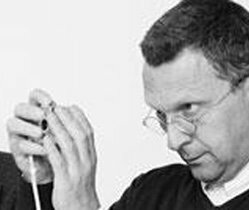 His work has led to highly successful products that won a host of international awards.In 1993 K. Prey became Professor of Product Design at the Bauhaus–Universität Weimar, at the Faculty of Art and Design, Weimar, Germany, founded in the same year by Prof. Lucius Burckhardt. Thus, he had the great opportunity to contribute actively to its development from the beginning.In 2002 Kuno Prey returned to Italy where he founded the new Faculty of Design and Art at the Free University of Bolzano/Bozen.